This Two-Pieces Bikini swimsuit from Hampton Mermaid is perfect for beach or pool with soft an amazing style. 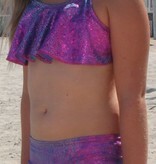 The 2 piece bikini swimsuit features a beautiful Sea Pebble print, to match your mermaid tail. Made in USA by Hampton Mermaid.